Besides being gruesome and disturbing, this (WARNING: it is very disturbing to watch for most people) video of a cow appearing to be skinned alive in the recently circulated Milton, ON video had shock value. It now appears, at least to me, that it was likely being done, not for religious, but more for political reasons. Why would someone video, and then circulate a video, showing jovial men skinning a cow, dead or alive, at a place, and in a manner, that is illegal to do so? Skinning a live cow is contrary and disturbing to the human moral code of Western democratic values where we don’t intentionally cause a living being to suffer, especially if the cruelty is being carried out for pleasure. Notably, cruel treatment of an animal is also against some or most Islamic teaching about this optional ritual of animal slaughter, which squarely aligns with Canadian laws. In Canada, as anyone living here for more than a few months knows, we have laws and practices, and very active and efficient, high-profile, nationwide organizations like the “Society for the Prevention of Cruelty to Animals” who regularly and publicly identify and take to court those guilty of cruelty to animals. In Canada we rescue animals from cruel pain, we don’t inflict it. The SPCA has standing to pursue charges against those who inflict cruel pain on animals because it is widely and scientifically established that animals suffer pain. So, it is not anthropomorphic to put ourselves in the place of an animal writhing in pain. The range and depth of emotions an animal experiences may be debatable; however, our own eyes and ears tell us animals experience emotion. We see animal mothers risk their own lives to protect their offspring, everything from ducklings stuck in drain pipes, to killer whales supporting the dead carcas of their offspring on their noses, to the cow in the adjacent photo who, through determined persuasion, got a human to rescue her calf stuck under an electrical fence. The cow who had her throat cut and was skinned alive in Milton had a mother that would have fought for her. The cow had experienced life on earth, and besides the physical pain, had the sensory range to feel basic confusion at the pain being inflicted, and fear for what was to come as she was hoisted upside down, her legs spread open, and knives cutting into her. First, the law is clear: cutting the throats of animals outside of a meat processing plant, outside of the governmental oversight established to prevent cruel treatment, is against the law. Secondly, besides breaking meat processing laws, did these Islamists also commit cruelty to an animal by skinning her alive after cutting her throat? A Halton Police statement said that animal cruelty charges were not being laid because it appeared that the cow was already dead. Based on the very start of the video, Halton police appear to be mistaken. (Notably, the Ministry of Agriculture continues to investigate, and presumably the Ontario SPCA who has not yet made a statement.) My outrage at seeing humans cause this animal pain was greater than my strong aversion to gore, and so I watched it carefully, second by second. Certainly, at various points in the video the cow’s head movements are from the shifting of the contraption used to hoist her up with her legs spread open; and, from the men cutting into her. However, when the video is played starting at a black screen at 0:00 the cow, with shoulder on the ground and no one near her head, the cow lifts her head. The contraption appears stationary, and there are no men cutting into her at the time to explain the movement. Be warned that they are gruesome, but, click here if you would like to see the still images showing this. At the end of the day, even Halton Police are only saying what “appears” to them, and did not offer a definitive conclusion, which is telling. Perhaps what is most important is the intention of these men. It could be argued that the men in the video didn’t mean to do this, that they didn’t know the cow was still alive when they skinned her. We know that Halton Police commented that the video occurred around Eid. If this was performed for so-called “religious” reasons, what about the demeanour of these men? They do not appear to be performing a “religious” ceremony with any degree of solemnity. It has more of a backyard horror movie, sadistic aesthetic. Moreover, did these Islamists intend for the cow to be dead or alive when they were skinning her, since it is the intention of some Islamists to be dealing with live animals? Thirdly, what does Islam have to say about the cruel treatment of animals? A whole lot more than weak-kneed politically correct politicians have to say. there need to be rules to both protect animals and to impart a higher spiritual significance to an act that could easily degenerate to wanton cruelty..We’re not living 1400 years ago, and whether some of us like it or not, the world is changing…For those who need to take a life in order to survive, then let them do so humbly and with respect for the life they are forced to take, showing as much mercy and compassion as humanely possible in an otherwise regrettable situation. Given that Islamists who practice this optional ritual intend to cut the throats of live, not dead, animals so that the animals bleed out slowly, did these Milton, ON Islamists in the video intend to be skinning a live animal? It is a reasonable conclusion. But maybe the Islamists thought the cow was dead by the time they began skinning her? This is where, not only the SPCA, but the Ministry of Agriculture slaughter rules come in. In Canada, based on the moral code that we don’t inflict cruel pain on animals, this is not something that is left up to the discretion of five apparently knife-happy guys who have no problem slitting the throat of a live animal. There are meat inspectors who make these judgements. It is not left to individuals who have no training, or those who have no regard for the cruel treatment of animals. For example, the man at 0:00 of the video, doing the skinning, stands with a knife at the rear end of the cow. He appears to glance at the cow’s head when her head moves. 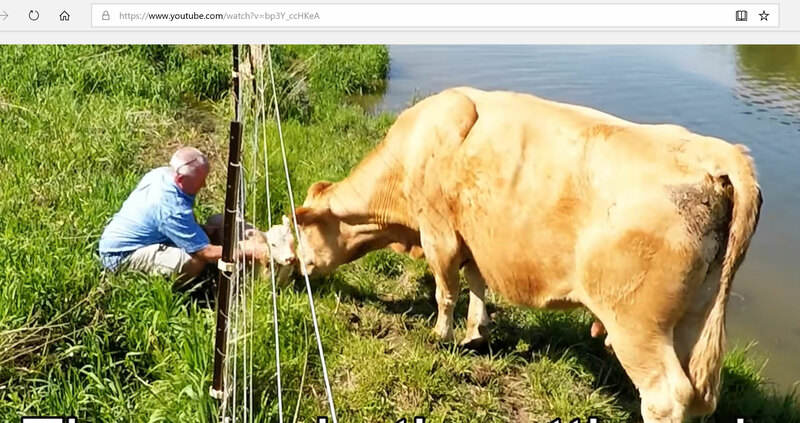 Also, at 0:42 the man in the blue and white shirt walks by and slaps the cow on the side as one would a live cow. This part is speculative, and for trained people, and legal authorities to determine, but we do know that this is an illegal situation to start with. These men are breaking Canadian law by undertaking the slaughter outside of a meat processing plant. The alternative, said Elmuradi, is that many people are getting their meat through underground channels and said he too might be compelled to go that route. No, going underground is not an “alternative” in Canada. The law is the law. Islamists who practice this optional ritual cannot bold faced say, ‘we are just going to go around your laws if you don’t let us break your laws’. If someone doesn’t like Canadian laws that are in place because of democratically elected representatives, they can try and get politicians voted in who favour the laws they want in place; or, they can leave and go to a country where people have already voted or dictated the laws that suite them. It appears to be a statement to Canada, from a relatively small percentage of Muslim activists who choose to practice this optional Islamic ritual, that they are going to cut the throats and/or skin live animals right under our Canadian noses, contrary to Canadian laws and customs and their own Islamic teaching. Perhaps they feel emboldened by the extraordinary, near stupefying support of Prime Minister Trudeau for all things Islamic. For Canadians, including apparently the majority of Muslims, if we were to turn a blind eye to the intentional infliction of cruelty to animals, for any reason, we would have to deny our human moral code and be complicit in the suffering of animals. This cannot happen in Canada. We rescue animals in distress, we do not inflict cruel and unnecessary pain and fear on them. Canadians have to also lift our heads in spite of the pain and fear of our politically correct society that enables handfuls of extremist activists to change Canada into a society of their choosing; and, uphold Western democratic rights and freedoms that people fought and died for, and to which others risk their lives to find refuge in; and, that squarely requires humane treatment of animals. This entry was posted in Halal Islamic Sharia Law, Politics, Canada, Think Over News and tagged cow, halton police, milton, ontario, skinned alive, spca.